Iquitos remained a sleepy little village stocked with Jesuit and Franciscan missionaries trying to convert the native Indians for many of the years since the discovery of the Amazon River by a retired pig farmer, Conquistador Francisco Pizarro. Although the Aztecs and Mayans had used “caucho” for many years in their daily lives, Iquitos changed drastically after Carlos Condamine sent the first samples of latex back to Europe around 1870. The town of Iquitos quickly exploded and by 1880 many accounts indicate the population doubled to almost 20,000 people. The industrialization of Europe along with advances in the processing of the latex into rubber created a demand that sent the price per kilo of caucho soaring to 6 soles in 1911. Rubber barons flooded Iquitos with cash and opulence. In 1905 Iquitos saw its first electricity, followed by a wireless telegraphy link to Lima, paved roads and a water system. Beautiful tiled mansions went up around the city. It was said that some of the “nuevo” rich sent their laundry to England to be done. At its height the population topped 30,000 people. But the bubble burst almost before it began, early in the process (1876) the British government commissioned the purchase of 70,000 rubber tree seedlings to be sent back to England and planted in the Royal Botanical Gardens. Only a few thousand survived but enough to move seedlings to Malaysia and a scant thirty years after the boom began the bottom fell out and the price per kilo plummeted to about ½ soles per kilo. And like a flash in a pan the rich left as fast as they came leaving an indelible mark on Iquitos that you can see today. Today Iquitos has over 400,000 residents. Probably the most prolific and beautiful building in Iquitos is the old Malecon Hotel, sitting on the boulevard and watching over the Itaya River. This grand old building, with its tile and iron façade housed the rich and famous during the day and was the location of many parties and poker games for the rubber barons. Today it houses the Peruvian military. One of the more famous buildings is the Casa de Fierro (Iron House) on the corner of the Plaza de Armas. This building was designed by Gustave Eiffel, designer of the Eiffel Tower. Gustave designed the building to be portable and it was unveiled at the Paris Exhibition in 1878. The idea was to provide a prefabricated building that could be used for colonial expansion overseas. Rubber baron Julius Toots bought one of the buildings and brought it to Iquitos, where he sold it to Vaca Diaz who planned to move it up the Ucayali River to assist in his rubber business but the plan never materialized and subsequently the building was divided to create two buildings, one was built on the Plaza de Armes, the other was built and eventually through lack of care was dismantled and sold for scrap. 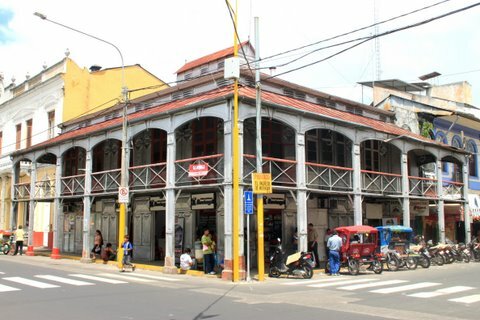 The Casa de Fierro still stands on the corner of the plaza, over the years it has served as a rubber baron’s mansion, a restaurant, grocery store and confectioner’s shops. Today there is a pharmacy and souvenir shop downstairs and the upstairs is available for rent, any takers? As you can see below although much as changed in Iquitos over the last 100 years, much has remained the same. The trolley station on the Plaza de Armes is gone but the plaza remains the central point for the community to gather for various events. The boulevard has narrowed as the Itaya River has encroached on the city but it remains the center for entertainment on weekend nights. Today Iquitos has been revitalized with the discovery of oil in the region, the ever present lumber business and an ever growing tourist trade centered around auyasca or jungle tours. Today Iquitos is a bustling city of over 400,000, but it maintains that small town feeling, partially due to the lack of skyscrapers and cars but mainly due to the friendly people. Some areas in town have totally changed since the early days.